I can't find the name of it, but I read a book a while back that discussed just this - the author had been an extremely successful intellectual, but quit to run a motorcycle repair shop. He found that the "big" work was absolutely unrewarding due to no real tangible feedback - he never knew if he was doing well, and had no payoff, but repairing a motorcycle is something that is extremely tangible and rewarding in that you can see the results of your effort. I see someone already mentioned his name (Matthew Crawford) below. 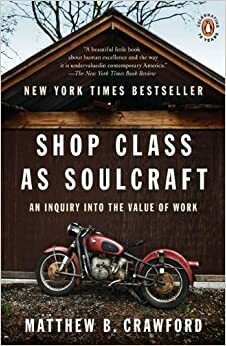 For those who enjoyed "ZenATAOMM", I found another in a similar vein: "Shop Class as Soulcraft: An Inquiry into the Value of Work"
"...author Matthew B. Crawford questions the educational imperative of turning everyone into a "knowledge worker," based on a misguided separation of thinking from doing. Using his own experience as an electrician and mechanic, Crawford presents a wonderfully articulated call for self-reliance and a moving reflection on how we can live concretely in an ever more abstract world."